The folks at the Rose Garden showroom in New York City just introduced me to a wonderful fashion find. 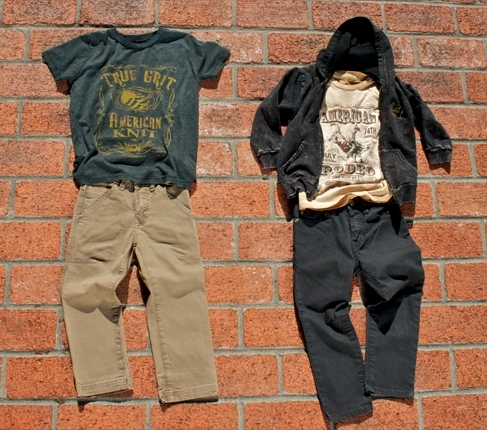 Last American Brand is the freshest thing to hit the boys market! Cool, trendy premium tees … hoodies and pants for boys and kids – Last American Brand is not only Made in the USA (California, to be exact), all the designs, marketing, photography and distribution of these knitted goods are also produced locally at the company’s studios and manufacturing houses. All of our garments are one of a kind; no two are exactly alike. Last American Brand makes what they call True Grit American Knit – the knitting, marking, cutting, sewing, dying and printing are completed in the United States. Inspired by the diversity of the United States –the land and its people- Last American Brand is committed to bringing quality clothing and American design to the kids of the world. Now in its second year, the line expands to include a selection of hoodies and woven bottoms with individual style and unique washes.